Trump said lawmakers must close “loopholes” that allow gang members to enter the country. 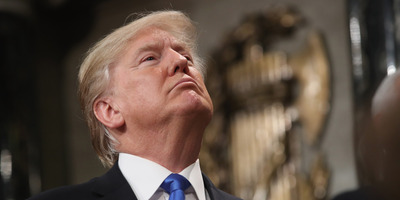 President Donald Trump on Tuesday said he’d “love to see a shutdown” of the federal government over immigration legislation if Congress cannot close what Trump called “loopholes” in immigration laws that allow alleged gang members to enter the country and evade deportation. Officials told Trump that the Department of Homeland Security has no authority to refuse entry to immigrants with gang affiliations, based on those gang affiliations alone. Nor does the department have the authority to deport gang members – they must first have committed a violent crime, the officials said. Trump’s comments came amid congressional negotiations over the fate of “Dreamers,” young unauthorised immigrants whose protections under the Deferred Action for Childhood Arrivals program are being phased out. Lawmakers are attempting to craft bipartisan deals that address DACA, along with Trump’s other three so-called “pillars” of immigration reform: border security funding, terminating the diversity visa lottery, and ending certain family-sponsored immigration categories. Trump’s shutdown threat received some pushback during the meeting, with Republican Rep. Barbara Comstock chastising Trump and noting that neither party wants a shutdown and both are in favour of cracking down on MS-13. “We don’t need a government shutdown on this,” Comstock said. “You can say what you want, we are not getting the support of the Democrats,” Trump said, interrupting her.